Whilst here, he oversaw two lightweight stress tests of the banks, before we got serious under the whip-hand of the IMF and ECB and did it properly at the start of 2011 – by “properly” I mean the results were given more credence by the audience of markets and government though at €30m-odd, they were certainly more expensive than what went before. Matthew was close to the helm when the €30bn of promissory notes were created. Retail banking competition has contracted with banks deleveraging and rationing lending, there are some horror stories about tracker mortgage holders being strong-armed onto variable rate mortgages, variable rates are rising when the trajectory at the ECB is flat to declining. There has been no enquiry into swap mis-selling even though there is a steady stream of actions in our courts. The credit union sector has been bailed out and we still have very expensive receivers acting in the Newbridge branch. Nearly two years after NAMA’s tranches 3/4 were acquired with a par value of €19.2m, the due diligence by Matthew has still not been completed. On the other hand, the word from those close to the Bank, is Matthew has changed the culture which is now more engaged and accountable than it was under the previous string of Government appointees – some might even call Matthew’s predecessors, “lackluster insiders”. It is thanks to Matthew we have the quarterly data on mortgage arrears, so at least we generally know the scale of the problem, even if solutions have remained elusive. And, although it was controversial and a sizable number vehemently disagree with the decision, the view on here is that Matthew showed courage, a sense of probity and a commercial instinct when he acted against Quinn Insurance. As for his successor, the odds-on favorite is his underling Fiona Muldoon who was confirmed this week to have the poison-chalice responsibility for the mortgage resolution targets – the view on here is that 25,000 sustainable mortgage solutions by the end of June 2013, two months hence, is fanciful; sincerely though, good luck to her. When Matthew’s resignation was announced by the Governor of the Bank, Patrick Honohan, it was stated that Matthew was waiving a €100,000 bonus which was magnanimous of him. Questioning in the Dail however raises doubt as to whether the bonus was actually awarded. Minister Noonan was asked “the date on which the bonus was awarded; the amount of the bonus awarded; the maximum bonus to which Mr Elderfield was entitled; and if he will outline the objectives met by Mr Elderfield which gave rise to the award of the bonus.” [ENDS] The relevant response from Minister Noonan merely states “Mr Elderfield agreed to defer the payment of any possible performance related bonus, which was due in January 2013, as part of his terms and conditions of employment agreed, until the end of his employment with the Central Bank. Mr Elderfield has subsequently advised the Commission of the Central Bank that he has waived his €100,000 bonus entitlement at the end of his contract of employment. “[ENDS] The Central Bank was asked for comment and if it might clarify the position, but there was no response at time of writing. There are now, also, questions about rules within the Central Bank to stop employees departing for the private sector where their privileged knowledge might be deployed to the benefit of their new employer. Matthew’s new employer, Lloyds still has a huge exposure to Ireland with its legacy Bank of Scotland (Ireland) loans, some of which are now managed on behalf of BoSI by Certus. Matthew does not have a commercial function at Lloyds but as a director, even of conduct and governance, he is in a position to potentially be very helpful indeed to Lloyds, though there is no suggestion here that Matthew would ever use his three years of privileged knowledge to Lloyds benefit. But what is to stop him? Minister Noonan’s response will not fill you with confidence; the Bank might move resigning employees away from duties which might bring it into conflict with a new private sector employer but there seems to be obstacle, like a confidentiality agreement or Standards in Public Office which might hinder a departing employee to spill the beans to a new employer.Worrying. (1) Deputy Pearse Doherty: To ask the Minister for Finance if he will outline the rationale for providing for a €100,000 termination bonus for the Financial Regulator who was appointed in January 2010 and who has recently tendered his resignation to the Central Bank of Ireland. Deputy Pearse Doherty: To ask the Minister for Finance if he will outline the duties to be performed by the Financial Regulator during his remaining six month’s employment at the Central Bank of Ireland; and if he will provide the expected salary and allowances to be paid to the Financial Regulator during this period. Minister for Finance, Michael Noonan: I propose to take questions 208 and 210 together. The terms of the contract agreed by the Central Bank with the Deputy Governor Financial Regulation provided for a performance related payment of €100,000 payable on review of performance at the end of the third year of the contract. When Mr. Elderfield’s contract was agreed in November 2009 the bonus was part of an agreed remuneration package which involved a 50% paycut from his salary in Bermuda. 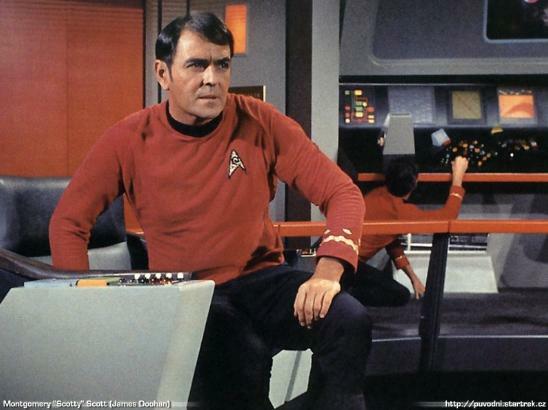 Mr. Elderfield subsequently took a 15% cut in his Central Bank salary. Mr Elderfield agreed to defer the payment of any possible performance related bonus, which was due in January 2013, as part of his terms and conditions of employment agreed, until the end of his employment with the Bank. Mr Elderfield has subsequently advised the Commission of the Central Bank that he has waived his €100,000 bonus entitlement at the end of his contract of employment. The Deputy Governor of Financial Regulation will continue performing the duties as outlined in the contract of employment. However, where a conflict of interest could be perceived in supervisory and other issues he will step away with immediate effect from involvement in these issues. Remuneration for the period is as per the terms in the contract of employment. 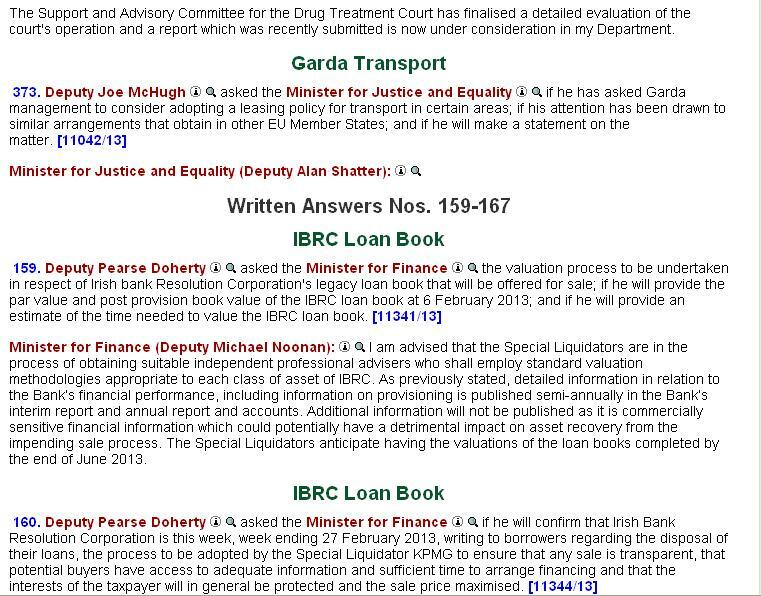 (2) Deputy Pearse Doherty: To ask the Minister for Finance further to Parliamentary Question No. 272 on 29 January 2013, the reason it has taken nearly two years for the Financial Regulator to validate the process of the transfer of tranches 3 and 4 to the National Assets Management Agency where the par value of the loans was €19.2 billion and the NAMA acquisition was completed in June 2011..
Minister for Finance, Michael Noonan: While I cannot comment on the work undertaken by the Financial Regulator, as the Deputy will be aware the validation process is complex and the work is essential to ensure that the European Commission guidelines ensuring full transparency in relation to state aid are complied with. I am advised that the process to have the final tranches validated is in its final phase and will be concluded shortly; at that point my Department will be in a position to apply to the European Commission for its full approval. (3) Deputy Pearse Doherty: To ask the Minister for Finance further to Parliamentary Questions Nos. 208 and 210 of 23 April 2013, if he will confirm if a bonus had in fact been awarded to Mr Mathew Elderfield; if so, the date on which the bonus was awarded; the amount of the bonus awarded; the maximum bonus to which Mr Elderfield was entitled; and if he will outline the objectives met by Mr Elderfield which gave rise to the award of the bonus. Minister for Finance, Michael Noonan: I am informed by the Central Bank that the terms of the contract agreed with the Deputy Governor Financial Regulation provided for a performance related payment of €100,000 payable on review of performance at the end of the third year of the contract. When Mr. Elderfield’s contract was agreed in November 2009, the bonus was part of an agreed remuneration package which involved a 50% cut from his salary in Bermuda. Mr. Elderfield subsequently took a 15% cut in his Central Bank salary. Mr Elderfield agreed to defer the payment of any possible performance related bonus, which was due in January 2013, as part of his terms and conditions of employment agreed, until the end of his employment with the Central Bank. Mr Elderfield has subsequently advised the Commission of the Central Bank that he has waived his €100,000 bonus entitlement at the end of his contract of employment. Minister for Finance, Michael Noonan: I am informed that the Central Bank has relevant policies and procedures in place to deal with this potential matter and the Bank believes that its current policies and procedures are appropriate. Specifically, this potential issue is taken into account when drafting new contracts for certain roles or reassigning staff to other duties if a potential for conflict arises. The Central Bank Code of Ethics requires that in the event of an employee intending to leave the employment of the Central Bank to take up alternative employment, self-employment or business, there is an obligation to provide early notification to line management when a conflict of interest exists, or perceived to exist, between those duties held in the Central Bank and those to be undertaken with the new employer, self-employment or business. In such circumstances, the Central Bank may assign alternative tasks to the individual while their notice period is being served. The notice period may be lengthened in excess of the contractual or statutory notice period, by mutual agreement, where it is considered to be in the best interests of the Central Bank and the employee. (5) Deputy Pearse Doherty: To ask the Minister for Finance the constraints that apply to employees of the Central Bank of Ireland in the context of resigning and moving to a private sector organisation where confidential or privileged information acquired at the Central Bank of Ireland may be deployed to the benefit of that private sector organisation. Minister for Finance, Michael Noonan: I am informed by the Central Bank that it has relevant policies and procedures in place to deal with this potential matter and that its current policies and procedures are appropriate. Specifically, this potential issue is taken into account when drafting new contracts for certain roles or reassigning staff to other duties if a potential for conflict arises. The Central Bank Code of Ethics requires that in the event of an employee intending to leave the employment of the Central Bank to take up alternative employment, self-employment or business, they are obliged to provide early notification to line management when a conflict of interest exists, or might be perceived to exist, between those duties held in the Central Bank and those to be undertaken with the new employer, self-employment or business. In such circumstances, the Central Bank may assign alternative tasks to the individual while their notice period is being served. The notice period may be lengthened in excess of the contractual or statutory notice period, by mutual agreement, where it is felt that this is in the best interests of the Central Bank and the employee. Revealed! The league table of our overseas diplomatic missions, analysed by country. I say “overseas”, but in 2012 we managed to spend €648,614 on a so-called “secretariat” in Belfast and €537,962 in the exotic city of ….Armagh! This week, the Tanaiste and Minister for Foreign Affairs provided details of the €52m cost of running our diplomatic missions across the globe in 2011 and 2012. The results are intriguing, with us spending more in each of Mozambique, Zambia and Uganda than we did in Germany. We spent more in Vietnam than we did in India. And we spent more in Lesotho – small landlocked impoverished mountainous expanse in southern Africa – than we did in Brazil or Mexico. We spent more in Iran than we did in Latvia. We spent more in Sierra Leone than we did in Cyprus. And 2012 saw the final costs coming in for Vatican City, with that mission controversially closed. There are a few countries in which we don’t have representation which look like odd omissions – New Zealand, Venezuela, Chile, Jordan, Bahrain, Peru, Colombia, Libya, Pakistan, former Yugoslavian states except for Slovenia, Caribbean countries generally, former USSR countries except for Russia, central America except for Mexico and all of the smaller Pacific islands. It should be stressed that the figures EXCLUDE two major expense headings, the cost of diplomats sent from Ireland and the capital cost of buildings and we know that there have been some rebuilding works that have attracted criticism in the past. Hopefully these omissions will be rectified in the near future so that we can get a total picture of how we spend our money on diplomatic missions. You can see the PQ which revealed the informationhere where there is a split by city and expense heading. UPDATE: 7th May, 2013. An Tanaiste and Minister for Foreign Affairs Eamon Gilmore has now confirmed the salaries and allowances paid to Irish staff in 2011 and 2012 together with the capital expenditure on diplomatic Missions. 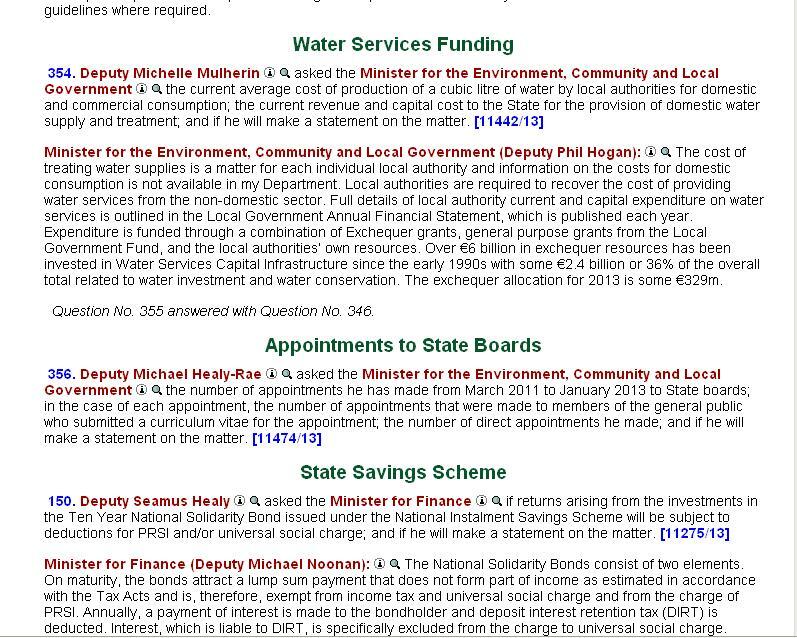 In 2012, €20,367,563 was paid in salaries and €8,709,948 in allowances and €878,604 in capital expenditure. Public Interest directors Margaret Hayes and Ray MacSharry are resigning their roles as public interest directors at Permanent TSB. They announced the resignations at the end of March 2013 and they will not seek re-election at the PTSB AGM on 22nd May 2013. Just before Christmas 2012, the hapless Margaret and Ray schlepped up at the Oireachtas finance committee where they were abused for a couple of hours for failings at the bank. At the time, the role of public interest directors was coming under the spotlight and it seems that the 75-year old Ray and the former civil servant Margaret have had enough. But what will the resignation of these two business and public service titans mean for PTSB? In the Dail this week, the Government provided a considered assessment of the impact of the two resignations. Deputy Pearse Doherty: To ask the Minister for Finance if he will provide an assessment of the risk to the financial health and profitability of Permanent TSB as well as to the public interest, from the announced resignation of persons (Mr Ray MacSharry and Ms Margaret Hayes) from the board of PTSB in May 2013; and if he will make a statement on the matter. Minister for Finance, Michael Noonan: As the Deputy will be aware it is a matter for the Chairman of Permanent TSB to ensure that the board of directors is of sufficient size and has an appropriate mix of expertise to comply with governance, company law and regulatory requirements. I have been informed that the current board complies with all relevant requirements but is subject to on-going review and renewal as required. As the Deputy will be aware the directors have fiduciary obligations to the company and have obligations under Section 48 of the Credit Institutions (Stabilisation) Act. I often wonder what our Nobel laureate poet Seamus Heaney has been doing for the last five years, when the economy has imploded, emigration has returned with a vengeance and the country is suffering agony – surely a poet might bother to chronicle such seismic national events, pick a few bon mots and maybe even get some of them to rhyme. Our creativity hasn’t been much in evidence on TV or film either – surely there’s a drama to be made in the style of Conspiracy to set out what happened on the Night of the Bank Guarantee. Comedian Tommy Tiernan partly makes up for it and lifts the team this week with these observations on our crisis. The report and accounts for the Irish Film Board for 2011 were published this week. This is an agency into which we shovelled €18.4m in 2011, comprising €16m earmarked for artistic investment and €2.4m for running the agency. It employs 14 people in Ireland plus a CEO and their total salaries are shown as €904,007 or an average of €60,267 excluding pension contributions and given the CEO gets €95,000 it would seem the salaries are very good indeed. The IFB seemingly employs two further people in Los Angeles. In Ireland, it costs €276,015 to house the 14 staff apparently, and the quango has a range of interesting expenses including a €14,000 subscription to employers’ organization IBEC. 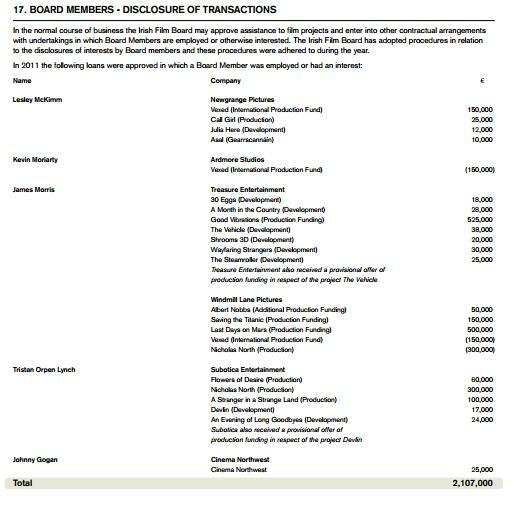 Best of all though were the loans to board members, totaling over €2m in 2011, see below. Fine Gael stalwart and RTE sports commentator, Bill Herlihy has just been appointed chairman of the IFB. Dontcha just love this country! 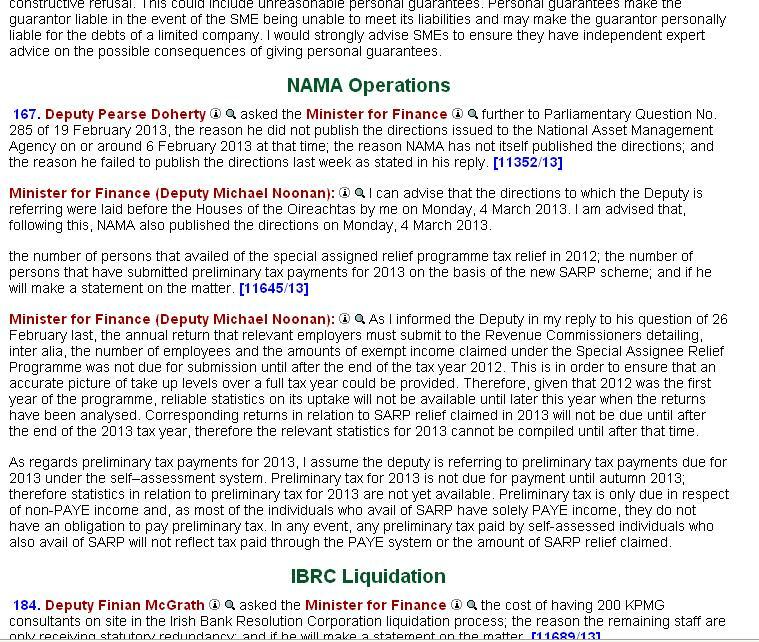 NAMA, the biggest state agency by a country mile, reported its unaudited accounts for the year. Here is an agency which generated €1.4bn in revenue, disposed of €2.8bn of loan and property assets, advanced €1bn to developers and is currently sitting on €3bn of cash. It generated a profit of €300m before tax. For an Agency that was created from scratch three years ago and which employs 250 today, the results are stonkingly impressive. Yes, it acquired €74bn of loans for just €32bn, but commercial property prices in Ireland have declined 27% since and residential property is down 32% and the economy is at best bumping along the bottom with banks not lending. All in all, the NAMA staff deserve a pat on the back, when you consider what a disaster the whole project could have been. The results didn’t garner many column inches. The Irish Times managed to get its reporting badly wrong by claiming that NAMA had already obtained judgments against the six parties it sued in the last quarter of 2012. Some of the cases remain outstanding and I think that ex-BDO, ex-Property Industry Ireland Ronan King will be interested to know the Irish Times says that NAMA has obtained a €559,700 against him (it hasn’t, NAMA has just applied for a judgment). Yesterday, we finally saw the 2012 financial results for Independent News and Media, in Ireland publishers of the Irish Independent, Sunday Independent, Herald, Sunday World, Belfast Telegraph, Sunday Life, Irish Daily Star and a number of provincial newspapers. The group has apparently agreed a deal with banks and its pension fund which should see the group rationalized and placed on a secure financial footing. Alas, there is still some cost-cutting to go, and 10% of its 1,000 staff face the chop in the coming year. Rival newspaper publisher Johnston Press, which publishes some Irish provincial titles, this week demonstrated an impressive obsession with cost control when it closed a premises in Scotland and relocated a journalist to….. a local library! There’s more – Johnston Press said its reporters would be “out in the community more than ever”. How long before the occupants of IN&M HQ on Talbot Street will be working from the Dublin City Library in the Ilac Centre and IN&M’s Lucy Gaffney telling them the move will improve editorial standards by journalists being closer to the community! This was also the week that the Independent.ie reported that it would be introducing what Independent.ie called a “metred paywall” – how many metres tall will the paywall be, no-one yet knows. But given we have to listen to all of this, isn’t it amazing that the old media has failed to inform us that we’ve slipped back into recession. Columnist Colette Browne was the first journalist in the Irish old media to inform the nation that we had returned to recession, this more than a month after the CSO confirmed two consecutive quarters of contraction of GDP. The Financial Times became the second old media outlet to do the same yesterday. 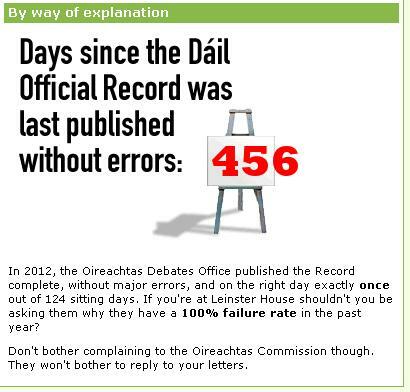 Where were RTE, the Irish Times (“the paper of what have you”), the Independent and Examiner on 21st March 2013, when the CSO released its figures. And yesterday, RTE managed to interview the CEO of Independent News and Media about that company’s annual results for 2012 and didn’t probe the debt restructuring which affects two state-owned banks which reportedly have exposure of €150m to IN&M. So we were given almost-bewildering facts about profits and losses and balance sheets but somehow our exposure to IN&M was overlooked. It’s not unusual to hear rages against austerity from individuals or the usual suspects, but this was the week when the planets aligned and giants in our cosmos all came out against austerity. We had the European Commission president, Manuel Barroso claiming austerity had reached its limits; we had SIPTU general president Jack O’Connor snaffling the entire €1bn saving in 2014 from the recent promissory note deal and claiming that for his members and he too was saying austerity wasn’t working; we even had business group IBEC warning against higher taxes and their impact on jobs. We had Minister for Social Protection and perhaps future Labour leader, Joan Burton criticizing austerity and its effects across Europe, and of course Ireland is still part of that Europe! We even had the lords spiritual wading in, with Archbishop Diarmuid Martin setting out the effect austerity was having on society. Unfortunately, there really isn’t much alternative to austerity in a currency union where the primary objective is price stability. If stimulus and growth could be achieved at the click of a finger, do you not think they would have been attempted already? We need to cut the gap between spending and income, so that as a nation, we can stand on our own two feet again. The best we can do is spread the period out over which we close the budget deficit gap, but unfortunately with debt:GDP already at 121% and a mighty €207bn of planned-debt by the end of this year, we really can’t spread the period out too much. At this stage, our problem is debt and unless we default, then unfortunately Michael “Scotty” Noonan has no choice but to give her some more but that doesn’t mean he doesn’t have choices in how the deficit gap is closed. Some good news this week from the Department of Finance which provided what it called “half-finalised” economic results for 2012 which showed that our deficit as a % of GDP in 2012 was 7.6% which was a full 1.0% less than the target we have with the Troika. Yes we had the windfall of the mobile phone licence and we had Minister Reilly acting the eejit with the health budget and we have slipped back into recession on the most modest basis in 2012, but all-in-all, the result shows the firm trajectory back to a balanced budget. 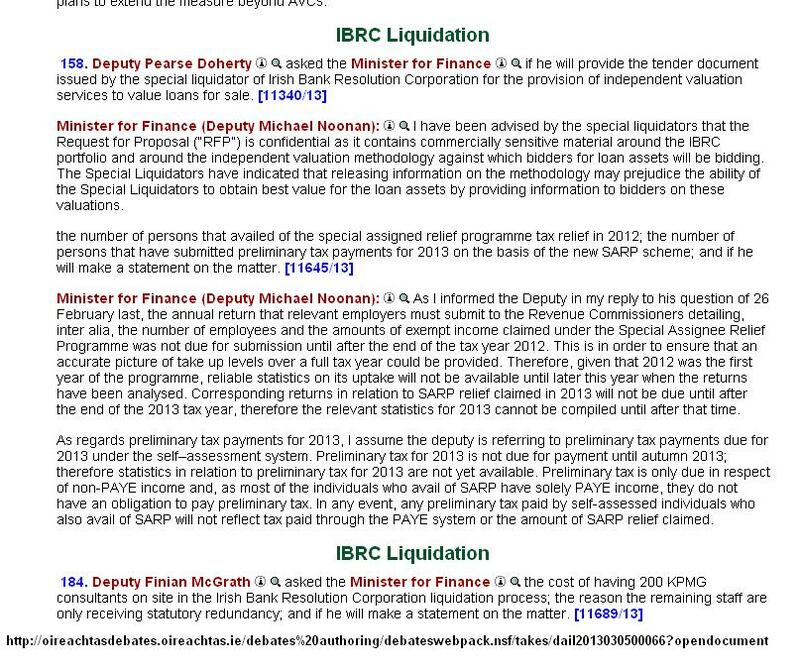 Debt is planned to be €207bn at the end of 2013 though, and the betting on here is that we will have €1-3bn extra cost this year for IBRC’s liquidation and the jury is still out on NAMA with residential and commercial property prices still declining. Permanent TSB and AIB and even Bank of Ireland are not fully out of the woods, and may be back with the begging bowl. Somehow, Professor Morgan Kelly’s May 2011 estimate of €250bn debt doesn’t seem at all fanciful. Last Sunday, the tone on Twitter was lowered with the above promotional tweet from Ernst and Young. You might recall the Enda Farrell affair at NAMA when the now former NAMA employee firstly purchased a property owned by a NAMA developer without, according to NAMA, disclosing his interest and then in an investigation, the more serious matter of loan details being leaked by Enda was uncovered. 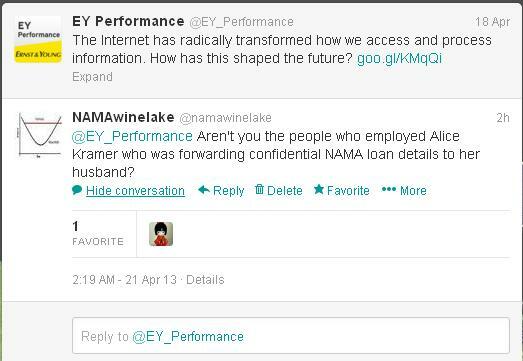 What Enda had done was to send files to his wife Alice, who at the time occupied a senior position at Ernst and Young, and Alice forwarded the emails to Enda’s personal email address; that way, Enda bypassed controls at NAMA which stop information being sent to personal email address and the ruse also masked the leaking of the information. Alice has since left Ernst and Young, but how rich of E&Y to now promote its expertise in accessing and processing information! There was no response from E&Y to the comment above. The Garda investigation of the information leaking appears not to have yet resulted into any arrest. NAMA was seeking costs for its court action against the formerly-golden couple, and Alice was defending the action by claiming she didn’t know the contents of the emails; that case appears to have settled without its terms reaching the media. And finally, the Belfast Telegraph reported last week that police chased a 59-year old man through a forest for 30 minutes before apprehending him. A 59-year old man wearing stockings and suspenders. And nothing else. For 30 minutes! The Dalai Lama certainly seems to have found it amusing above. In a suburb in south Derry which has attracted a reputation for gatherings of what might be called an unconventional nature, two PSNI officers responded to reports of there being a naked man about, and when they arrived at the woods in the Prehen area of the city, they chased the man for 30 minutes before finally apprehending him. Perhaps dope-cheating athletes should dispense with the steroids and the diuretics and just don stockings and suspenders, maybe the embarrassment-factor might be enough to power them to victory.